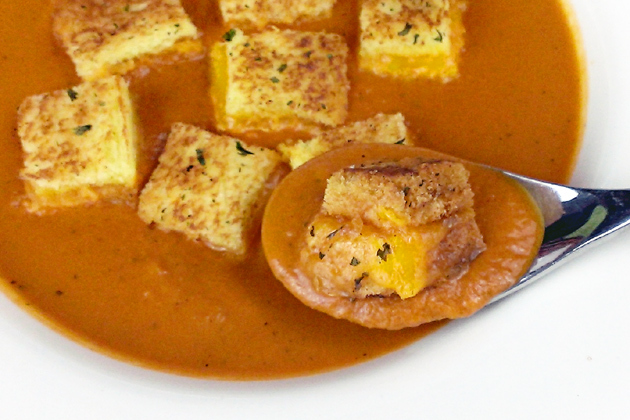 Tomato soup with a grilled cheese sandwich is about as all-American as it gets. I grew up eating and loving this meal, as I suspect many (if not most) of you have. This is my homemade Daddio-style take on this familiar classic. For this recipe I wanted to keep the tradition firmly in place, but I also wanted to bring a new freshness to the party. This is one of those meals that is so emblazoned in the mind and on the tastebuds that it's really easy to mess up an already nearly-perfect thing. A mere glance at a can of Campbell's tomato soup is all I need to taste it in my mind. I immediately imagine that rich creamy tomato goodness dripping off of the corner of a gooey grilled cheese sandwich. I know that I have raised my kids properly when they are immediately dubious of the notion of "homemade tomato soup". It's sort of like that popular internet meme of late, "One does not simply... Make tomato soup." Well, I did, and here it is. Heat the olive oil in a large sauce pan over medium heat. Add the onion, carrot and celery. Cook uncovered until the onions and celery are translucent, stirring frequently. Add the garlic to the pan and continue to cook, uncovered, one minute, stirring frequently. Add the wine and cook two minutes longer. Add the remaining ingredients, bring to a simmer, cover, reduce the heat to low and cook at a low simmer for 30 minutes. Blend with an immersion (stick) blender until smooth, cover, and keep hot. Combine the butter, garlic and parsley in a small bowl and microwave one minute to melt the butter. Brush one side of each of the slices of Texas toast evenly with the melted butter mixture. Assemble the sandwiches by arranging three of the slices of the buttered bread, buttered side down, on a large sheet pan. Add two slices of cheese to each piece of bread and top with the remaining bread, buttered side up. We're simply making three grilled cheese sandwiches the easy way. Put the sheet pan on the center rack of your oven and cook until the underside of each sandwich is golden brown. You'll have to check them periodically, but it should take about five minutes. Flip the sandwiches and continue to cook them until the pan side is golden brown, about 2-3 minutes. Remove the pan from the oven and let sit for five minutes. Cut each sandwich into one-inch squares. 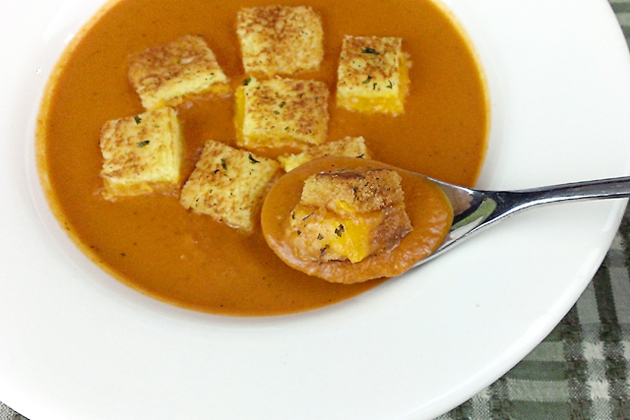 Pour a serving of soup into each of 4-6 bowl and float an even portion of the grilled cheese croutons in each. Thanks for the recipe Patio Dadio - it's Bobby Frapples approved! That sounds like a great meal to warm my family up during this cold winter we are having! Going to give it a go!